Australia is the home to seventeen World Heritage Sites. The UNESCO World Heritage List, is an international register of properties that are recognised as having outstanding cultural or natural values of international significance. 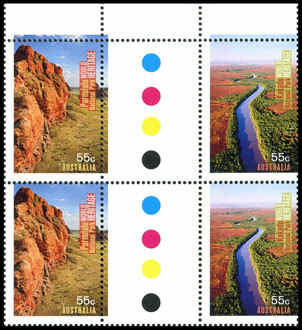 The 45c Uluru, 45c Tasmanian Wilderness, $1 Lord Howe Island and $2 Kakadu stamps were also issued in the Commonwealth Games 2006 Snapshot! booklet. The stamps from this booklet can be identified from the original printing. 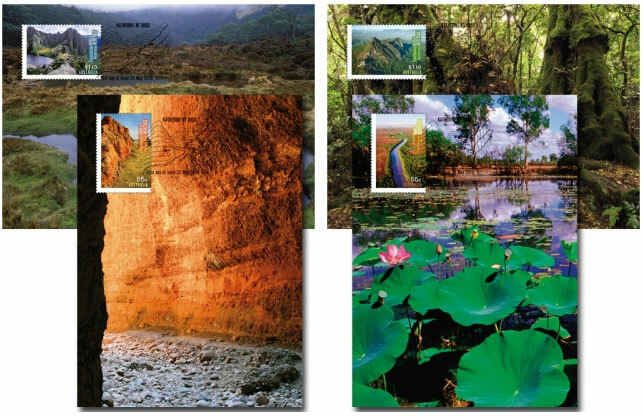 Featuring 50c Wet Tropics of Queensland, 50c Greater Blue Mountains, $1 Purnululu National Park, $1.80 Uluru-Kata Tjuta National Park. The four stamps were released in se-tenant pairs with a stamp featuring a world heritage site in the United Kingdom. 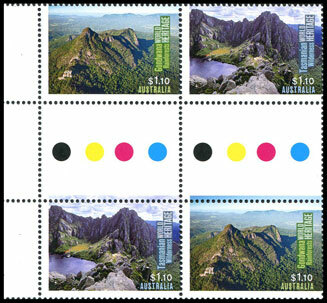 This issue of four stamps includes one site that has not appeared on a stamp: the Gondwana Rainforests. The three after World Heritage Sites that have yet to appear in a World Heritage issue are: Great Barrier Reef, Queensland; Royal Exhibition Building and Carlton Gardens, Melbourne and; Sydney Opera House, Sydney. Heard Island and McDonald Islands, and Macquarie Island are also World Heritage Sites, but are administered by the Australian Antarctic Division. An issue for the bicentenary of the discovery of Macquarie Island will be issued in October. The 55c and $1.10 stamps were issued in se-tenant horizontal pairs. 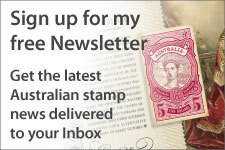 Unlike most issues featuring se-tenant pairs, these stamps only exist in horizontal pairs. Collectors might notice that the layout of the $1.10 sheet produces a vertical gutter pair, whereas vertical strips of five from the top and bottom panes contain the same stamps. 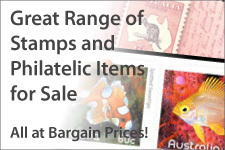 There is no way to obtain vertical pairs of the 55c stamps. 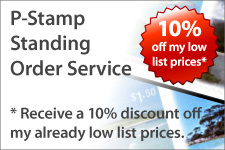 Self-adhesive stamps were issued in coils of 100 stamp and booklets of 10 stamps. The same printer printed both the coils and booklets, and are the stamps identical. The difference in paper used is because of the different backing paper used. There are minor varieties in the shape of the die-cutting which warrant further investigation. Booklets were distributed to post offices in chequebooks of 20 booklets. These are not listed on this website. A set of four maximum cards accompanied this issue.